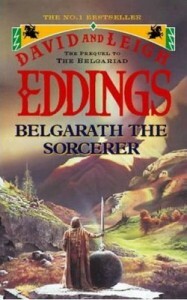 Several years after finishing the Malloreon, Eddings returned to the world of the Belgariad to write a prequel to the events in the two series. This is essentially a autobiography of Belgarath, the wise but slightly disreputable old man that advised Garion throughout his journeys. By the start of the Belgariad, Belgarath was over seven thousand year old – so this book effectively doubles as a history of Eddings' fantasy world. It starts off in the days when humanity was a primitive collection of tribes, one day a young Belgarath set off on a journey to discover the world. Eventually he ends up starving and lost in a forest, where he comes upon a tower occupied by a strange old man. It turns out that the tower's inhabitant is actually the God Aldur, who has decided to train Belgarath as his first disciple. A few years later, a wiser Belgarath begins to go out into the World and manipulate its people in such a way that millennia in the future the world will be in such a state that the events in the Belgariad will occur. 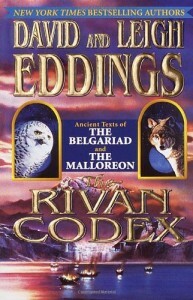 The plot this time is comparatively innovative by Eddings’ standards – there is no grand quest here, instead there are lots of small events, each of which Belgarath has to manipulate in such a way that the Prophesied future will come to pass. Along the way there is a bit of sarcastic commentary from Belgarath as he makes observations on past events and takes a few opportunities to bring up old arguments with his daughter Polgara. Again, this is quite well written with plenty of likeable characters and the fact that Belgarath is narrating the tale leads to some entertaining narration. The plot is a bit convoluted considering it takes place over several millennia and makes numerous references back to Eddings’ previous works, but it all seems to make sense. In summary, this an entertaining book that provides an interesting insight into the background behind the events in the “Mallorean” and “Belgariad” series. This is possibly Eddings' best work. 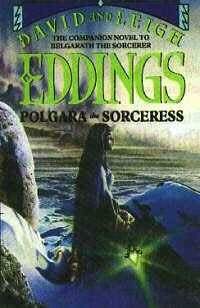 For his next book Eddings decided to write another prequel – this time covering the life of Belgarath's daughter Polgara. To some extent it seems a bit unnecessary, since many of the same events occur in this book as well – although from a different perspective that sometimes contradicts Belgarath's version of events. There are also a few new sections, covering periods in Polgara's life where Belgarath wasn't around to observe events; these sections are probably the most interesting parts of the book. Again there is quite a long stretch of history covered, over three thousand years, but by this stage most of the major characters are familiar from previous books so it is easy to ignore the size of the timescale. As with all the other books in this series it is reasonably well written with good dialogue and decent characters. One slightly irritating feature is that Polgara herself is quite arrogant and gets a bit annoying at times which can be an issue since she is the central character. In summary, another reasonably well written book but it doesn't really add all that much to the overall story. The final book in the world of the Belgariad is not a novel at all, instead it is a background book containing information on the geography, peoples and history of the series, as well as come commentary from David Eddings himself. Most of this information is taken straight from the preliminary notes Eddings made when writing the Belgariad, unfortunately some of this information had been changed by the time the books were written. The result is therefore that some of the information is inaccurate which makes the book a bit pointless as a source of information about the fictional world. Eddings' introduction is probably the most interesting part of the book, although he does seem a bit arrogant about his achievements. In summary, a pointless background book that isn't particularly interesting and is also inaccurate.